* learning when to pay attention and when to let your mind wander wherever it wants to. 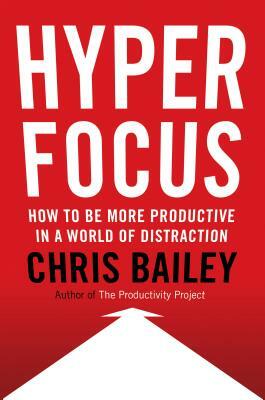 Chris Bailey has been intensively researching and experimenting with productivity since he was a young teenager, in an effort to discover how to become as productive as humanly possible. To date, he has written hundreds of articles on the subject, and has garnered coverage in media as diverse as The New York Times, The Wall Street Journal, GQ, The Huffington Post, New York Magazine, Harvard Business Review, TED, Fast Company, and Lifehacker. The author of The Productivity Project, Chris lives in Kingston, Canada. "An engaging book . . . When Mr. Bailey was writing this book, he may as well have pinned my photo above his desk and labeled it 'my audience.' . . . Hyperfocus helped me recognize the limits of my attentional space and make my environment more conducive to focus . . . Mr. Bailey teaches how to re-examine your tasks, determine your priorities and minimize interruptions. . . . When I started the second part of the book, I excitedly placed exclamation points next to all of the examples of places your mind could go if it was left to do its own thing." "In this practical and widely applicable manual Bailey . . . identifies distraction as an endemic probem plaguing the business world, and just about every facet of modern life as well . . . Highly germane to any fast-paced workplace, this book is a must-read for readers seeking to regain control of their ability to concentrate." "Hyperfocus does a remarkable job of unpacking the realities, obstacles, and best practices of managing the subtle but ever-present world of our conscious attention. All of us can get better at how, when, and on what we focus; and this is an extraordinary, eye-opening and research based report of what affects us in this regard, and how to take advantage of this information to achieve greater satisfaction in our lives. Bravo, Chris." "The best productivity plans call for strategy, not just hacks or tactics—and Hyperfocus gives you strategy in spades. When you read this book, get ready to do your most important work!" "I read Hyperfocus on my phone . . . but this book was so engaging I stopped checking email entirely! I highly recommend this book to anyone looking to do more of what matters in a distracted world." "There are two kinds of focus we need in order to pursue what’s essential in life: focus as a noun (our fixed intent) and focus as a verb (the ongoing process of connecting the dots). This is brilliantly illustrated both in writing and in graphics in this latest book from Chris Bailey. I loved the book." "This book will appeal to a wide audience, from those in business to self-help seekers and busy parents."